Habitat: Mexico, El Salvador. Cattleya aurantiaca's natural habitat consists of low mountain and tropical rain forests between 300 and 1600 meters. Temperatures range from extremely hot to extremely cold. Plants are found growing on exposed rock outcroppings and on tree branches. Plant Size: Small. The cylindrical pseudobulbs of Cattleya aurantiaca are topped with two leaves. This species grows to a height of 18-24 inches tall and is a vigorous grower. With time it may form a large specimen plant. Flower Size: 1 inch wide (2.5 cm). The flowers of Cattleya aurantiaca form at the top of a 6 1/2 inch (16 cm) stem. Two to eleven flowers top each stem. Some cultivars have flowers that do not open fully. Some flowers self-pollinate prior to opening on individuals from the northernmost parts of the species range. Flower Description: Flowers of Cattleya aurantiaca are red-orange to yellow or rarely white. These substantial, fragrant flowers burst with stunning hot color. Growing Temperature: Cool to Warm. Cattleya aurantiaca is quite easy to grow and is compatible with other Cattleyas in an intermediate or warm environment and moderate light. Do let plant dry out in between waterings (moist but not wet). Provide adequate air circulation and humidity. South Florida growers say this species does well outdoors. Additional Information: Cattleya aurantiaca has the smallest flowers of all Cattleya species. It is also the most northern-growing species. 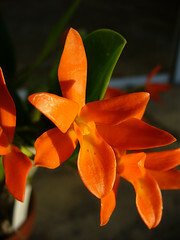 It has been used to bring the orange color to many modern Cattleya hybrids. Cattleya aurantiaca and Cattleya skinneri naturally hybrid to create Cattleya x guatemalensis. There is a yellow form available that has pale canary-yellow blooms called Cattleya aurantiaca var. aurea.